It’s hard to kill a Sith Lord. Long thought to be a dead project, The Force Unleashed: Ultimate Sith Edition made its surprise arrival on the Mac platform Tuesday. The Ultimate Sith Edition features not only the original intense action adventure game but several additional levels of downloadable content. Set in the years between Episode III and IV of the Star Wars saga, The Force Unleashed follows the story of Darth Vader’s secret apprentice as he tracks down rogue Jedi and does the bidding of his villainous master. One of the most popular console games of 2008, Mac gamers can finally get their hands on this unique chapter in the Star Wars universe. Apart from delivering intense lightsaber combat, earth-shattering force powers, and stunning visuals to Mac users, The Force Unleashed also offers several downloadable levels as well. These levels feature an alternative history of the Star Wars universe, one where the secret apprentice kills Vader and becomes the Emperor’s instrument of destruction. You’ll also be able to visit familiar locales like Tatooine and Hoth. The Mac version of the game was first demoed in August and given a fall 2009 release date. In November, however, rumors emerged that Aspyr was about to axe half of its staff. 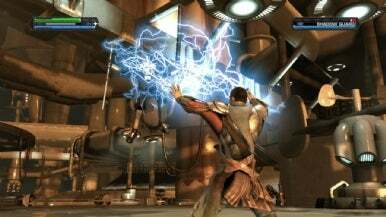 Though the details of the shakeup were never confirmed, the end of 2009 came and went with no version of The Force Unleashed for the Mac, and the game’s status appeared to be in limbo. That changed on Tuesday with the arrival of the Mac version. Hopefully, these extra months of development time have been good for the game, as Asypr’s PC port of the game was knocked by critics for supposed frame rate issues and overall sloppiness. While The Force Unleashed is launching for the Mac without the fanfare it deserves, fans of Mac gaming will be thankful that Aspyr actually finished what it started and made good on the promise of porting an exciting sci-fi action game to the Mac platform. The game can be downloaded at gameagent.com for $40.